Anna Laura Page received a Bachelor of Music in Vocal Music Education with a concentration in piano and Master of Music in Music Theory with a concentration in organ from the University of Kentucky. Active as a composer, clinician, and organist, she served on the Music Committee of the Southern Baptist 1991 Hymnal Committee and has served as Handbell Editor for the Supplemental Music Resources for the Celebrating Grace Hymnal that released in 2010. In addition, she has received the ASCAP Standards Award for the past several years. 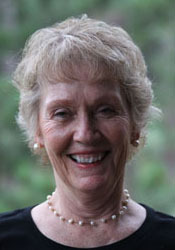 She has taught organ as an adjunct faculty member at Mercer University in Macon, Georgia, and theory/organ as an adjunct faculty member at Lander University in Greenwood, South Carolina. She served as director of the Austin Peay Community Children's Chorus in Clarksville, Tennessee for three years and later served as Handbell Music Editor for Alfred Publishing Co., Inc. Her publications include choral works for children, youth, and adults, and compositions for handbells, organ, and piano. She is married to Dr. Oscar C. Page, President Emeritus of Austin College in Sherman, Texas.